Two weeks ago, Mexican army forces captured a tank built by a drug cartel capable of hauling 12 gunmen and reaching 68 mph. Now authorities have taken another off the street — one that shows how every iteration gets tougher. 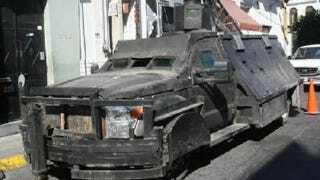 This one, dubbed the "compacto" version of El Monstruo 2010, appears to be a 2011 Ford SuperDuty truck chassis armored all over and given a bay for ferrying up to 10 gunmen. Captured in Jalisco, this version also came with its own entertainment system via speakers built into the back hatch, along with "satellite communications equipment." And unlike the El Monstruo '11, the builders were smart enough to protect the truck's wheels from stray bullets. Some 15,000 Mexican people died in drug-related violence last year, a toll the government says derives from "taking the fight directly to the cartels." The 2012 model year's just around the corner. Hat tip to Brook and ALSRAC!